DUG Insight User ManualFrequently Asked QuestionsFrequently Asked Questions HorizonsHow do I extract the number of events between 2 time horizons? Use this workflow to calculate a rough estimate for event counts, based on average frequency and time thickness of the target zone. This example calculates the seismic event counts from TopRes to BaseRes horizons for a 3D seismic volume in time. Click the Operations tab and select Amplitude Extraction from the Operation dropdown menu. 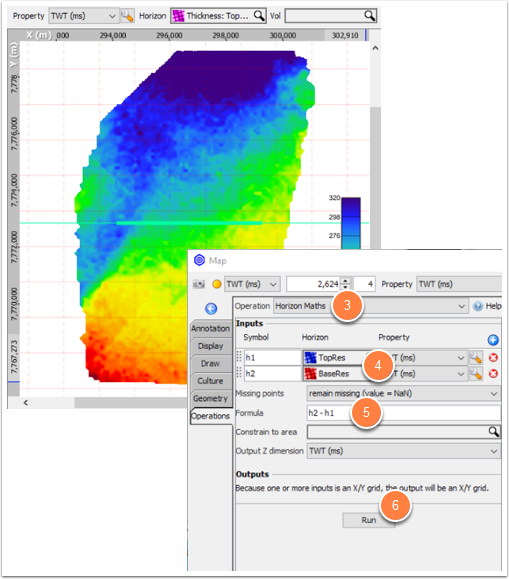 Top: pick Horizon from the dropdown and select the top horizon e.g. TopRes. 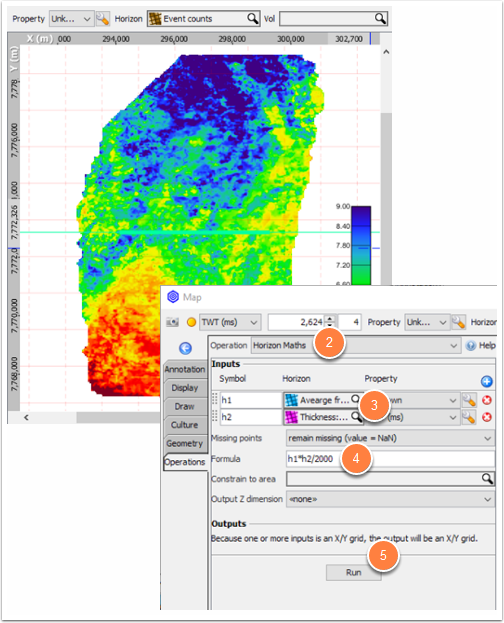 Bottom: pick Horizon from the dropdown and select the bottom horizon e.g. BaseRes. 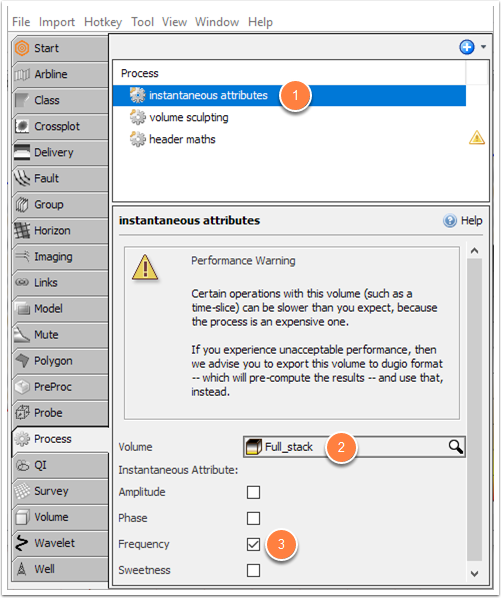 Use the created volume from the Instantaneous Attributes process e.g. instantaneous attributes: frequency. Use Simple Average as the property. Click the Operations tab and select Horizon Maths from the Operation dropdown menu. Use formula: h2 - h1. Use formula: Ave_IF x (Thickness_time / 2000) or h1 * (h2 / 2000). Go to Control panel > Process. Click the blue "+" button and add a Header Maths process. 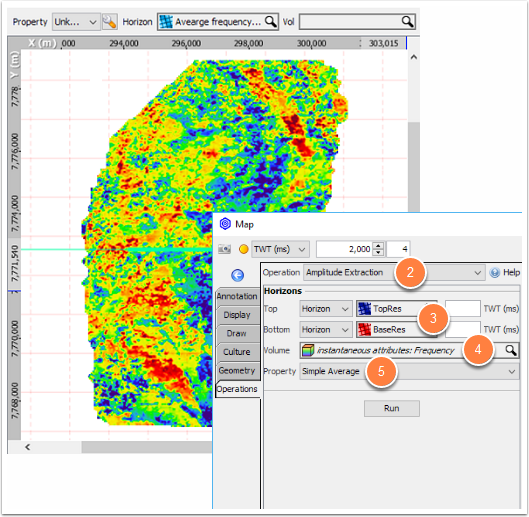 Select the seismic in the Volume search box. Add a new symbol by clicking the blue "+" button. Select the "Event counts" horizon as h1. Select header: 105 laga: SEG-D Skew. Use formula: if (isnan(h1), nan, h1). 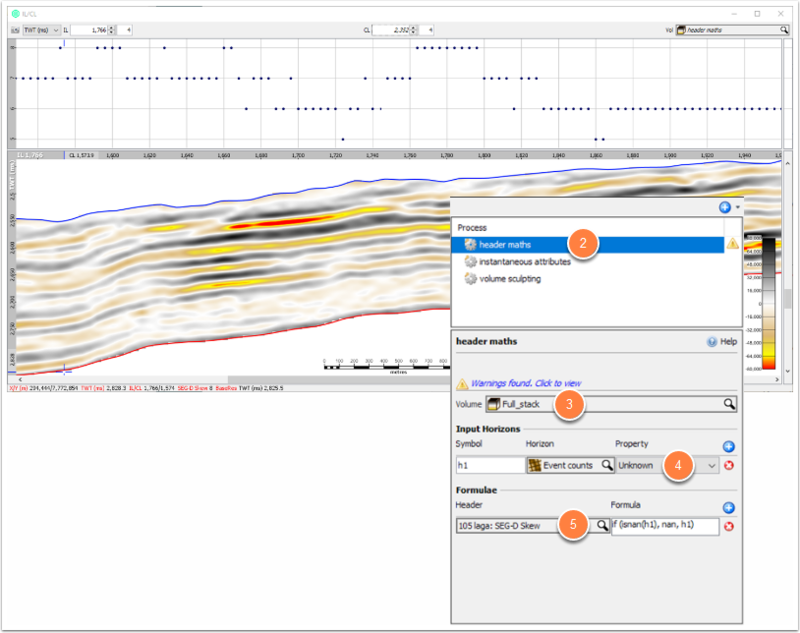 Note: To QC this event, use the IL/CL view and enable header graphs. Next: How do I perform an amplitude extraction between two horizons?